I feel very lucky to live a mere ten minute drive from Lake Roland. There are two entrances, one of which is at the Falls Road Light Rail Stop. This entrance leads to a boardwalk that enters the park with the Light Rail tracks to the left and dense, to light, forest on the right. As a new birder, that walk is an outstanding training resource. In the few months I’ve been birding with an aim to learn and improve, I’ve begun to recognize nearly every bird on the boardwalk, by sight and sound. Each visit I can reliably expect to see Hairy and Downy Woodpeckers (an early challenge is learning to tell these nearly identical birds apart), Tufted Titmice (or is it Titmouses? ), Great-crested Flycatchers (though they have been noticeably absent my last two visits), Northern Cardinals, Acadian Flycatchers, and Goldfinches. I recognize them at a glance now, and know their calls very well, which is exciting. Now, on that short walk, new sounds or shapes stick out like sore thumbs, and get me very excited. For instance, last night when I visited I heard, for the first time on the boardwalk, the unmistakable song of a Wood Thrush. Unfortunately it was too deep for me to spot, but I’ve grown confident in that bird’s call. Having not heard that call yet at Lake Roland, it jumped out at me among the calls I am now used to. Another bird that really stood out, that I saw at Lake Roland for the first time on 7/15, was the Carolina Wren. I had not actually seen this bird yet, so it was a lifer, and it was bouncing around right near the end of the boardwalk. There were two of them, and right away I knew I was seeing something for the first time. I had read on recent lists that birders at Lake Roland had seen Carolina Wrens, so I guessed right away this might be one, but I am not so good at this that I didn’t doubt myself. I took as many notes about the bird as I could before it was gone, and then consulted Merlin (an Android app) and my bird guide before considering it a new life list bird. I also got to hear its call three or four times, which pretty much confirmed it. I do wish I had the equipment to photograph the birds I am seeing, but there is something quite special about the fleeting experience of birding without a camera. 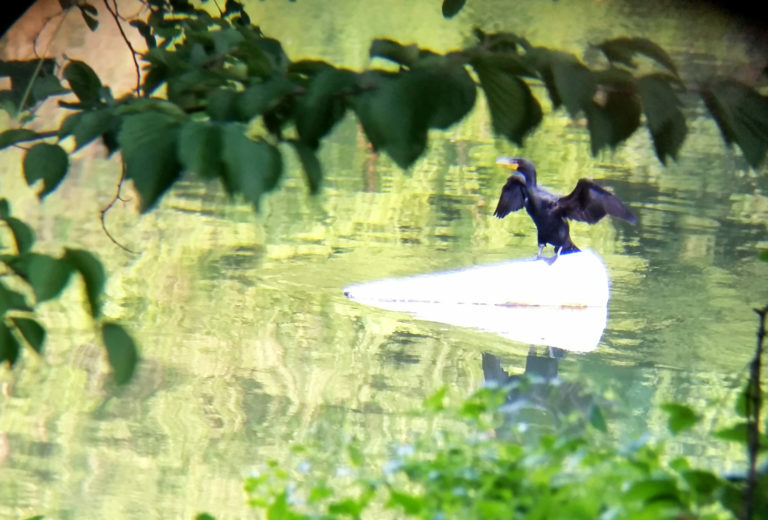 Sure, I’ll try to snap a photo with my phone and binoculars (like the Double-crested Cormorant above) when a bird is being very still, or isn’t a risk of flying off for the next couple minutes, but otherwise I see what I see, and if I want to see it again, I have to come back. It’s nice, and always rewarding. Like the Indigo Bunting. I’ve now see the fellow four times, and each one was just as exciting as the first. I did, however, have a Downy Woodpecker land in small tree not three feet from the boardwalk last night, so was able to capture a decent video of it. And one other bird that truly stood out was the Double-crested Cormorant near the dam. I hadn’t seen anything like it in the water yet, and was very excited that it wasn’t really doing much, so I had time to use H’s stroller as a tripod of sorts and snap a few photos through my binoculars. As far as birding goes, for me anyway, it was a great time. I’ve seen your lists on ebird and found this blog when I searched for your name. I enjoy the posts, and share your excitement about seeing new birds. There are lots of great places to explore in Baltimore! Hope in run into you some time, or if you want to bird some time just shoot me an email. Thank you for your comment! I am very excited to get out to the many places I’ve yet to explore. So far, I spend most of my time at Lake Roland since it’s just up the road, and planning further out trips requires some extra coordination with a one year old, ha! Though I had a wonderful time at Oregon Ridge and Sandy Point as well. If you see a guy with a beard, glasses, and a ratty old Orioles hat (and a baby), looking at birds, it’s likely me. I’m frequently at Orgeon Ridge since it is my local patch. You can see my lists there on the ebird Hotspot, and I’m happy to show you around a little. Shorebird season is fast approaching (or already begun), so Papermill Flats is the best spot close to you. I assume you don’t have a scope yet if you are just starting, and if you’d like to go there sometime to pick up new birds shoot me an email.